Three Republican senators on Wednesday introduced legislation supported by President Trump that would reduce overall immigration levels to limit low-skilled workers from entering the country, which the lawmakers say would boost wages. Sens. Tom Cotton (R-Ark.) and David Perdue (R-Ga.), who proposed the bill in the last Congress, have teamed up with freshman Sen. Josh Hawley (R-Mo.) to reintroduce the legislation, called the Reforming American Immigration for Strong Employment (RAISE) Act, at a time when a surge of migrants at the southern border has put a spotlight on the need for immigration reform. “For decades, our immigration system has been completely divorced from the needs of our country and has harmed the livelihoods of working-class Americans,” Cotton said in a statement. In the long run it makes little difference. Indeed, we could “solve” the whole legality problem with a pen stroke. By simply declaring “There Shall Be Open Borders.” So The Wall Street Journal long urged that Americans do. Then everyone who came in would be … legal. Just so, an amnesty for “DREAMERs” or “DACA” or the parents who smuggled them. That would make them instantly legal. See, it’s just like magic. And just like magic, it isn’t real. Mass immigration into today’s America isn’t a problem just because it’s illegal. It’s illegal because it’s a problem. How would we know if America really needed (as it once did) a million new unskilled workers every year? Easy, they’d all be finding jobs with health insurance. And paying taxes. And pretty soon, as they looked at all those taxes. … They’d start voting Republican in serious numbers. But that is not what’s happening. Is it? We don’t need a million or so low-skill workers, many of them high school dropouts streaming into our cities. Becoming eligible for welfare programs. Or having anchor babies who are eligible. All from programs they never paid into. Swelling the ranks of voters for Democrats. Helping politicians who promise to redistribute the wealth away from those of us who built it to these newcomers. They have no more moral claim on that wealth than the Spanish did on the gold they looted from the Aztecs. But our emergency wards in major cities are full of foreign citizens. And of their “birthright citizen” kids. They’re getting free health care, while we scrimp, save, or defer needed care, because we can’t afford our deductibles. Those health care workers aren’t slaves or volunteers. Somebody pays their salaries when they offer First-World care to people who can’t afford it. Who aren’t Americans fallen on hard times, or the descendants of slaves and victims of Jim Crow. They’re newcomers, with no moral claim on our money. But they’re going to get it. It’s no surprise that Democratic politicians, who lives as parasites on Leviathan, want to flood our country with new voters for their programs. Nor that Intersectionalists who consider America evil want to seed it with those who believe in sharia and jihad. What’s shocking is how long Americans have put up with this situation. replace the current employment-visa framework with what sponsors say would be a skills-based system that prioritizes immigrants who are more educated, speak English and show a record of achievement or entrepreneurial initiative. The bill would eliminate what sponsors call the “outdated” visa lottery program, which was created to promote diversity. Bravo to these Republicans for taking seriously American workers’ wages and the real needs of our economy. What’s shocking is that such a common sense bill is dead on arrival in the Democratic House, and even faces long odds in the GOP-held Senate. That’s just how drunk some Americans have become on the empty slogans sold by the open-borders movement, whose tentacles reach from the Democratic Party through labor unions, many churches, into the Chamber of Commerce. 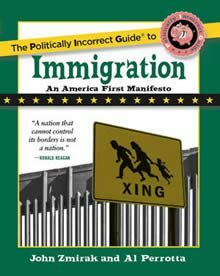 In our book, The Politically Incorrect Guide to Immigration, we offered a 15-point plan (“Mission America”) for a sane, patriotic fix of our immigration system. The RAISE Act would implement points 8, 9, 10, which are probably the most important. Below are the reasons why, adapted from the book. Chain migration must end. Chain migration allows newly naturalized immigrants to bring in an unlimited number of foreign relatives to the United States with them. According to the Center for Immigration Studies, over 60 percent of all immigration in the United States is due to chain migration. Others put the figure as high as 70 percent. Do the math. What’s more, as already noted, the new arrivals tend to vote Democratic. The problem of chain migration is another reason the president should not give status to “Dreamers.” The millions of future Democrats whom DACA and “Dreamer” illegals could invite here in future decades would seal the fate of the Republican party nationally and turn states like Texas purple, then blue. The RAISE Act, sponsored by Tom Cotton and David Perdue, would cut the long chain. It bases immigration on merit, skills, and English proficiency, rather than family ties. The RAISE Act or similar legislation must pass. If we continue chain migration, the chain will become a noose. America’s current immigration system includes a “green card” visa lottery. Technically, it’s called the Diversity Visa (DV) program. The name tells you a lot. Each year, fifty thousand people who want to emigrate are randomly selected to be given permanent resident visas. The idea is to diversify the U.S. immigrant population by selecting people from countries with low rates of immigration in the previous five years. The first question to ask is, Why do we even do this? It’s completely arbitrary, choosing immigrants based on no contribution they’d make to the country apart from showing up and adding “diversity.” We’re selecting people not on the content of their character but on their national origin. Judging them by their ethnicity, not their ability. But worst of all, awarding U.S. residency (which leads to citizenship) this way degrades the value of U.S. citizenship to the status of a prize in a lottery. The “diversity” isn’t even all that diverse, if you think about it. Why diversity by nationality? Why not diversity by height? By hair color? Diversity by astrological birth sign? How long before some pagan complains we don’t have enough Capricorns in America? We must change our legal immigration system to favor highly skilled workers who fit the American team. We must take those who fill specific needs for our country. This is nothing new. This is precisely how our Founders saw the issue. The terrorist who ran over and killed eight people in New York City in October 2017 entered the country via the Diversity Visa. In his case, maybe, the pro–open borders crowd has a point. He did benefit the economy. After all, he rented the truck used in the terror attack. We should favor highly skilled workers, with lower overall totals. Alabama Crimson Tide is the best of the best in college football. Each year they are in the hunt for the National Championship. They are elite. Many players from around the country, including a lot of very talented athletes, want to play for ’Bama. Alabama gets to pick and choose who among those hopefuls they bring onto the team — based on the needs of the team, each player’s character, and his fit within the program. If America wants a winning immigration program it should act like ’Bama. We must change our legal immigration system to favor highly skilled workers who fit the American team. We must take those who fill specific needs for our country. This is nothing new. This is precisely how our Founders saw the issue, as we laid out in chapter two of our book. dramatically reducing low-skilled immigration and revamping our system for skilled immigration. It would cut immigration by more than 40 percent immediately, and by half in a decade. … It would end the diversity lottery and preferences for family members aside from spouses, minor children, and elderly parents in need of care. And it would put those seeking green cards on the basis of employment — 140,000 of which would be available annually, the same number as today — through a new point system similar to those used in other developed countries. Your members of Congress deserve to know what you think about the Raise Act. To learn more about this existential national question, see The Politically Incorrect Guide to Immigration. Al Perrotta is the Managing Editor of The Stream. He was formerly the VP/creative director for All Comedy Radio, U.S. Editor for Reelworld Mornings and Passion Arts minister at Living Faith Christian Church in So. Cal. He is the co-author of the counter-terrorism memoir Hostile Intent, and several plays, including A Christmas Scene, The Table and the original musical Bethlehem.